Mother Nature has saved the brightest of all of the fall colors for last. Many trees have dropped their leaves but the Japanese maples seem to be among the last to put on their fall robes. Brilliant red, bright yellow and a mix of both colors are visible in many of the Japanese maples in the gardens and woodlands. The above red Japanese maple was planted many years ago and its name is long forgotten. This time of year it screams for attention. Behind it is the golden yellow of an Acer palmatum 'Omurayama' which was planted the same year. 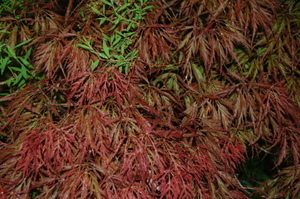 The full moon maple, Acer japonicum aconitifolium, blends its reds and yellow. The result is a leaf which glows as bright as any ember. The lime green of the Hakonechloa macra 'Aureola' has morphed to brilliant yellow which sits pretty right in front of the red cut leaf Japanese maple. Oak leaves are littering the ground and the time for chopping them and adding them to the garden beds is at hand. There are many chores to be attended to in the gardens. 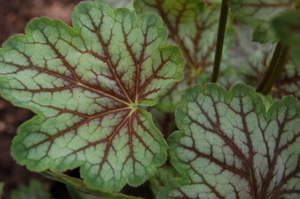 Some perennials will be cut mainly to reduce the chores of springtime. Others are left to feed the birds and add winter interest to the garden. The garlic needs to be planted quite soon and in the rest of the vegetable garden the arugula and kale are still being harvested. Brussel sprouts and carrots don't mind the cold at all. Their flavor is heightened by cool temperatures. There is nothing sweeter than a carrot pulled from the ground after a few frosts. November is a rather gray month in my garden. It is a transition from the brilliant decline of October to the dormant state of December. The first days though, are brilliant this year. What is shining in your garden at the beginning of this month? Well, the rain gauge is not working but it has rained and the rain did, in fact, interrupt the morning walk. It has been dark, dreary and chilly all day but as I look out the window, the Acer japonicum aconitifolium is a beacon in the garden and the one bright spot in the garden on this grey day. This tree never fails to color up and at a time when many of the native trees have lost their leaves. Here is a picture of the whole tree which is still small. It was given to me by a friend when it was just a few inches high. I always think of him when this tree puts on its' pumpkin color. Since this tree pulled me out into the garden on such a nasty day, I decided to take pictures of the other Japanese maples I have collected. It is not a large group but they are all pretty colorful at this time of year. 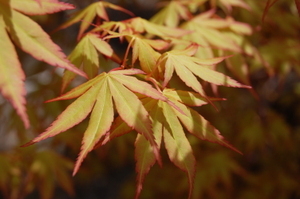 This is the foliage on the Acer shirasawanum 'Aureum'. It has a pretty red stem and most of the leaves have dropped at this point. 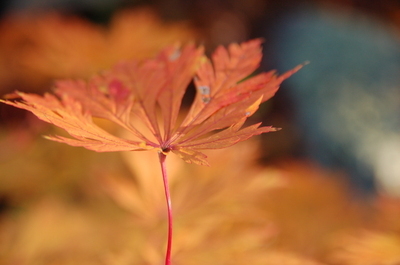 This next tree is Acer palmatum 'Omurayama'. 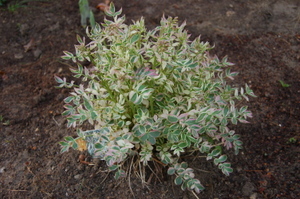 The leaves are a delicate pale yellow. It is starting to put on some size and should reach fifteen feet tall someday. 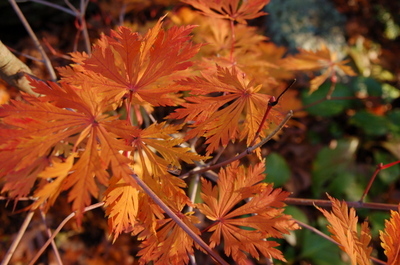 This next Acer is A. palmatum 'Osakasuki'. Gee, it is interesting to note that I actually wrote down these names when I planted these in 1999. This one is very slow growing and only three feet tall. I guess it probably doesn't like this spot. I will have to keep a closer eye on this one. I have some of the dissectums, both red and green. They add so much texture to the garden it would be hard to live without them. I almost forgot about the Acer griseum. This tree is not thriving either but it is alive and about eight feet tall. Perhaps it needs more sun but the foliage is bright and the bark is cinnamon, peeling, and wonderful. There is always something that shines in the garden, even on a nasty day. It just takes getting outside to find it. What is shining in your garden today? Most of you know that my fall colors are in Foster, Rhode Island. One small tree is still glowing brightly in my yard which is quite a welcome sight with the gray days of November in full tempo. This Japanese Fern Leaf Maple was a gift from a fellow gardener and it is now about six feet tall. When I received it, it was a three inch seedling but even at that small size it had the most beautiful leaves with each little segment looking just like a fern. 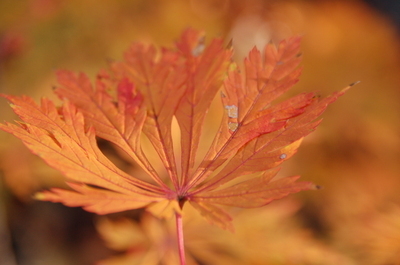 The Japanese maple species, Acer japonicum, have the wonderful feature of spectacular fall color. 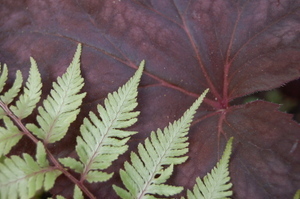 There are many cultivars available within this species. 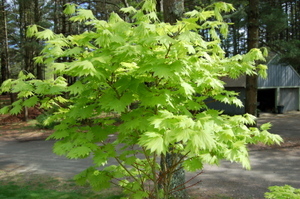 One of the cultivars, Acer j. 'Maiku jaku' has the fanciful common name of Dancing Peacock. Who wouldn't want one of these! I did see the parent of this seedling in full color in my friend's garden. The tree was about twenty feet tall and wide and breathtakingly beautiful in its' fall robes. The garden is, in part, a collection of memories of those friends who have shared the bounty of their gardens with me. Every time I pause in front of this tree I am thankful for the generosity of spirit and substance of fellow plant lovers. Polemonium 'Stairway to Heaven' which is quite nice despite that name! The garden is in its' cloak of spring blooms and all of these leaves just serve to enhance the picture. Do you have a favorite leaf? I'd love to add it to my collection. Spring green is a transient color lasting only a week or two before the darker green hue takes its' place. It is fresh and energizing. Today in my travels I came across several interesting variations on this color. 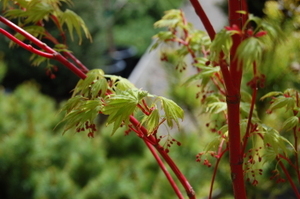 Here you can see it in contrast with the stems of the Coralbark Maple, Acer palmatum 'Sango Kaku'. 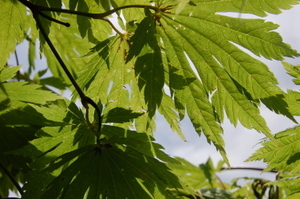 Another interesting maple is the Acer japonicum 'Aconitifolium'. 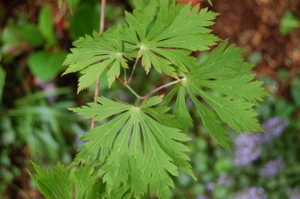 It has large, palmately shaped leaves as seen here. It is known best for its' great fall color but it is also really lovely in spring. One more maple, the Acer palmatum 'Katsura' is more golden than green but an interesting spring addition to this collection. These are generally small trees in the landscape and a worthy addition to any garden. There are many notable trees at Allen C. Haskell's in New Bedford but most are not yet clothed for spring . 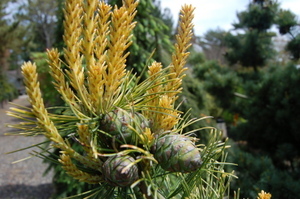 There was, however, an intriguing Pinus parviflora 'Goldilocks', with its' bright golden candles emerging and the cones which add another dimension to this specimen. Haskell's is a destination Garden Center. For a real treat, check out the video on this link and treat yourself to your own tour of Haskell's Garden Center. This is just a small sampling of beautiful trees available this season for the home garden.